Live in a Tropical Paradise? Materials Matter. If you live in a tropical paradise, materials matter. We want them to be aesthetically pleasing and able to withstand the climate (especially if you don’t have A/C). Here’s our two cents on some interior furniture and accessory materials that are the perfect umbrella to our tropical drink. While seagrass, bamboo and wicker are a popular aesthetic in interior (and even exterior) coastal furniture pieces, they can wear quickly (mold) in tropical, humid climates. Rattan is our top pick to withstand the elements while looking fabulous. Look for pieces constructed with strong poles and joints wrapped in leather, like these beauts from Williams Sonoma Home. Both sourced locally here in Hawai’i (so we know they adapt to our varying temps and moisture levels) and seriously melt my warm, textural design heart. But let’s think broader than floating shelves, even though I love me some functional, live-edge everything. How about using these gorgeous woods as picture or mirror frames to add warmth and texture to those paneled white walls? How about splurging on a custom crib creation for your baby? And if you have a fur baby, a custom dog house? Have a small space but still want a pretty console? Hello custom Koa and Cuban Mahagony slender console table by Rust & Root Furniture. Bathroom renovation? Go custom and modern with your vanity, like this one by Satoshi Yamauchi Furniture. Did I Mention Rattan? This Includes Lighting! I’ll say it again: lighting makes or breaks your design. If you can bring in texture, warmth and functionality with good lighting, you’ve scored major design points. 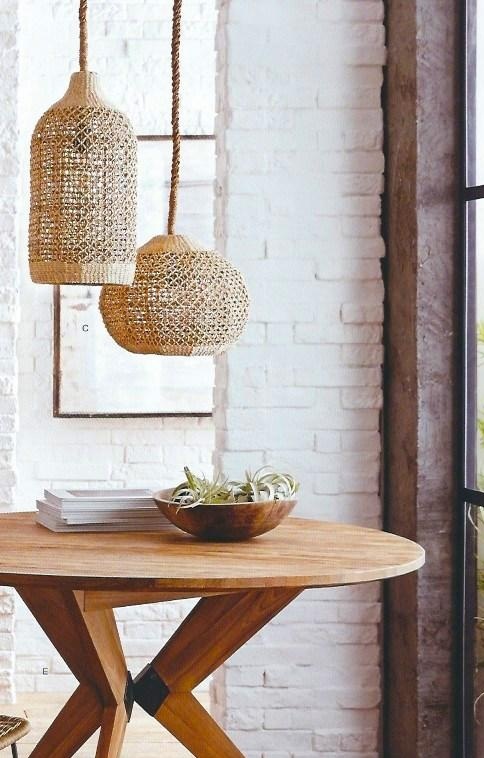 I’m obsessing over these beachy Roost Woven Pendants from Modish. Of course, to satisfy my love of the color black, this woven pendant from World Market gives me all the feels. To take the furniture durability game up a notch, there’s fabrics galore made to look and feel fabulous while being able to handle the elements of a tropical climate (as well as stains and spills). Stay tuned for more on that! TELL ME! What are some other creative ways you have incorporated these or other tropically durable materials in your home? Newer PostMatte Black Plumbing Fixtures: Trend or Here to Stay?